Discover beautiful and inspiring stock images with new content uploaded daily. Get inspired from high-impact Premium content, from Adobe's world-class community of creative professionals. Check out 4K and HD video clips in popular themes including lifestyle, sports and aerial shots. Search our expanding range of artist-designed templates for web, print, mobile, film and other projects. Unearth thousands of high-quality vectors as well as hand-drawn and digital illustrations. We offer a host of leading Editorial content covering the world of news, sports, entertainment and global events. Find the perfect high-res, royalty-free, stock image to enhance your next creative project. All from within your Adobe Creative Cloud apps. Preview watermarked images inside your designs first. 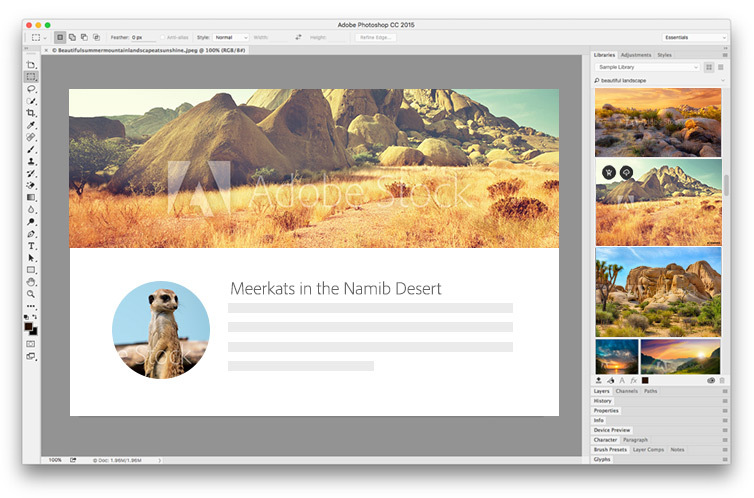 Then license, access and manage them directly within Photoshop, InDesign, Illustrator, and other Adobe desktop apps. Check out these popular categories. Beautiful fonts, anywhere you need them. Find great type for web, print, and beyond with Adobe Fonts.